This bumper sticker is such a profound message of respect for all life at all stages! We gladly proclaim this message on the back of our van! I know this message is planting many seeds as we drive around town and up to the Cities! 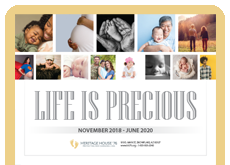 Thank you for making pro-life messages such as this available! God bless your work! Absolutely true and I will keep taking the message wherever I go! My wife and I have had this design in our shirts for more than 5 years now and counting! I ordered the envelope seals with this picture on them and was very impressed. I am excited to put this on my car. What a powerful image showing that life matters at all stages. How can someone not be touched by this beautiful sticker. This bumper sticker generated a lot of discussion at our Respect Life displays at church. Grandparents attending church with their grandchildren are awed at the gentleness depicted by the picture on the bumper sticker.